To reserve your spot, please contact us at Goodwin@goodwinarchery.com, or you may call Level 3 NTS Coach Joe Goodwin at 405-637-4129. Payment by March 16 will guarantee your place. Payment options will include check (mailed) or PayPal. Sorry, no walk-ins. This archery instructor certification course will prepare you with the knowledge and skills necessary for running an archery program. Certifications are good for three years, and are recognized by USA Archery, NFAA (National Field Archery Association) and ASA (Archery Shooters Association). All required equipment will be made available for the course, including recurve bows, arrows, quivers, finger tabs, arm guards, and targets. Participants are welcome and encouraged to bring their own personal equipment. Meals and room/board are not included. The venue has an onsite cafe as well as a variety of dining options within driving distance. 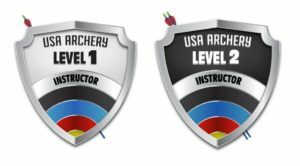 Level 1 instructors are well prepared to teach beginner archery programs to people of all ages and abilities in a variety of both indoor and outdoor settings. Level 2 instructors are well prepared to serve as the lead instructor for long-term archery programs and are introduced to the NTS (National Training System) Steps of Shooting. Level 2 instructors are qualified to teach Level 1 Certification Courses. Level 2 applicants must be a member of USA Archery, NFAA, or ASA. Applications will be available at the course. Level 2 applicants, and Level 1 applicants who work with a USA Archery youth organization, must complete a background check (cost $25). These may be completed in advance through this link at USA Archery. Mail forms will be available at the course. Level 2 applicants, and Level 1 applicants who work with a USA Archery youth organization, will be required to complete Safesport, a 90-minute online training module provided by the US Olympic Committee. The course is free of charge and may be completed in advance of the course. For more information, see this link at USA Archery. Boy Scout and Girl Scout leaders who wish to receive the discount must provide a copy of their current adult leader registration card. Wondering when the next class will be for LVL 1 and 2. Are you not doing the classes any longer? ?